Facebook advertisers were easily able to exclude groups such as Jews and the disabled from viewing their ads for housing, jobs and more. The company has committed to ending the practice and said most of the changes outlined in Tuesday’s agreement were already in the works or completed. Facebook will be legally required to end its practice of allowing businesses to block certain groups like blacks, gays and immigrants from viewing ads under an agreement reached with the Washington State Attorney General’s Office. The Attorney General’s Office said Tuesday it had launched an investigation into the social-media giant and successfully bought 20 fake Facebook ads that excluded various ethnic minorities in late 2016. The ads, all approved by Facebook, were in some cases blatantly racist: One housing ad contained a headline specifically stating that people of certain ethnicities need not apply; another was looking for a white tenant. The practice, first unveiled in a series of ProPublica articles that sparked the attorney general’s investigation, is one of several issues facing Facebook’s lucrative advertising network, which allows anyone from presidential candidates to the local flower-shop owner to micro-target its billions of users. 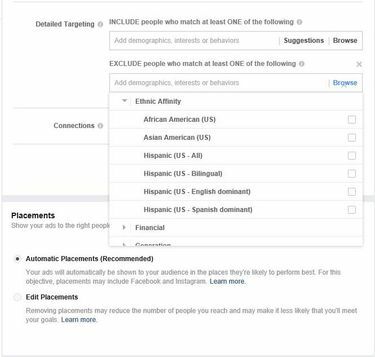 When advertisers launch a campaign, Facebook offers a drop-down menu where they can select what types of people won’t see their ads, which it calls “exclusion marketing.” A landlord could advertise an open apartment and make sure black Facebook users couldn’t see it, for instance — an apparent violation of fair-housing laws. The Attorney General’s Office noted that this type of misuse did occur on occasion with real-world advertisers, though it did not cite any examples. While it was possible for third-party advertisers to exclude blacks, Asians and Hispanics, there was no option to exclude whites, the Attorney General’s Office said. (Facebook tries to figure out each user’s race and other demographics based on their “likes” and other activity on the platform). Facebook has vowed improvements but has been slow to put them into action. It faces at least two lawsuits over the exclusion function, including one that alleges older people were blocked from viewing certain job ads. The agreement filed in King County Superior Court requires Facebook to block advertisers from excluding classes protected under state law, such as race, nationality, sexual orientation or disability status. It applies to most businesses and other places of public accommodation, such as schools and hospitals. The commitment will be legally enforceable only in Washington state, but Facebook says it will extend it nationwide. “In the same way you wouldn’t accept a brick-and-mortar business with a ‘whites only’ sign in their window, we should not accept entities on the internet being able to exclude people based on their race, sexual orientation” or other protected class, Attorney General Bob Ferguson said. Facebook said most of the changes outlined in Tuesday’s agreement were already in the works or completed. But Ferguson said it was still important to hold the company legally responsible to fix discrimination in its ad system, since past efforts by Facebook to do so have fallen short. Last November, ProPublica found it could still exclude such groups as people with disabilities and Jewish people from viewing housing ads on Facebook, more than a year after its first investigation was made public. Ferguson said he met with Facebook representatives in Seattle and had to impress upon them how urgent the issue was. “Discriminatory advertising has no place on our platform, and we’ll continue to improve our ad products so they’re relevant, effective, and safe for everyone,” Castleberry said. The agreement, called an “assurance of discontinuance,” requires Facebook to make the changes within 90 days. It also mandates Facebook to pay the attorney general’s office $90,000 in legal fees. And it formally ends the attorney general’s 20-month investigation into the company without any lawsuits being filed. As part of the deal, Facebook denied breaking any laws.